Galway county board chairman Noel Treacy says they were shocked to learn of discontent among the players. 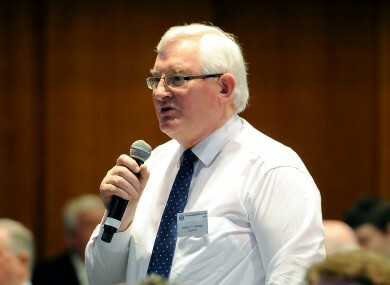 Galway County Board chairman Noel Treacy (file photo). COUNTY BOARD CHAIRMAN Noel Treacy insists the Galway hurlers did not raise any discontent until two of them came forward after the players’ representatives had earlier delivered a positive report on the year. Treacy said that he was shocked to discover that there were issues with the management as none had been voiced by the players in their dialogue with GAA officers. But one delegate told last night’s annual Galway convention that “every dog in the street” knew there were issues between the players and manager Anthony Cunningham long before the county committee said they became aware of them in early October. But Galway chairman Treacy said that players made no mention of any problems when they met county secretary John Hynes in early October — a week after Cunningham had been reappointed for 2016. “On Saturday morning 3 October last, the 2015 elected players’ panel gave our county secretary, John Hynes, a conclusive positive report on the out-turn for the year,” said Treacy. He said that there was no history of issues with the managerment and that the players’ representatives had not raised any problems. “I have chaired the county team managements panel for the past four years,” added Treacy. Galway secretary John Hynes said no problems were raised when he met the players’ representatives. “I met with players’ representatives on Saturday 3 October to review the players’ charter and background of the players holiday,” said Hynes. “I met with them in the Maldron Hotel and we went through the players’ charter and there was a few small issues with gear and pool allowance. “There was no other issue raised. They stood up shook my hand, were very happy with the year and walked out the door. Cunningham stepped down as Galway manager on 16 November after four seasons in charge. Six have been nominated for the position and interviews are due to start later this week after county committee officers are finalised for the year. Email “'Every dog in the street knew there was a problem in Galway hurling'”. Feedback on “'Every dog in the street knew there was a problem in Galway hurling'”.